Fashion is at it's most glamorous during the wedding season. 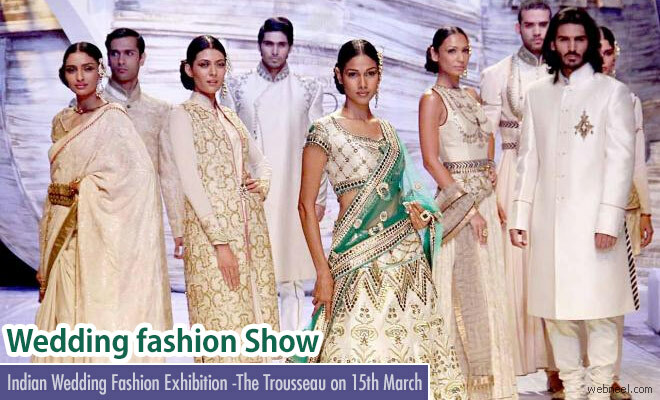 Catch a glimpse of this year's wedding fashion at 'The Trousseau'. The Wedding fashion will be held at Blue Sea Banquets,Worli, Mumbai South on 15th March 2017, between 11:00AM and 7:00PM. "It’s at the epicenter of Mumbai’s fashion scene so you’ll feel just as comfortable shopping in elegance. Get inspired by wedding and bridal wear, fashion products (ethnic and indowestern wear from across India), accessories (contemporary and traditional fashion jewellery, costume jewellery, semi precious and real jewellery), and much more by various creative designers and exhibitors" - according to eventshigh. The admission is free, so invite your friends and families and get a look at the most beautiful wedding fashion collections, so you can plan ahead for a beautiful occasion in your family or just pamper yourself.